Do you perhaps recognize the picture above? It’s a famous painting about a famous prayer: the Angelus! 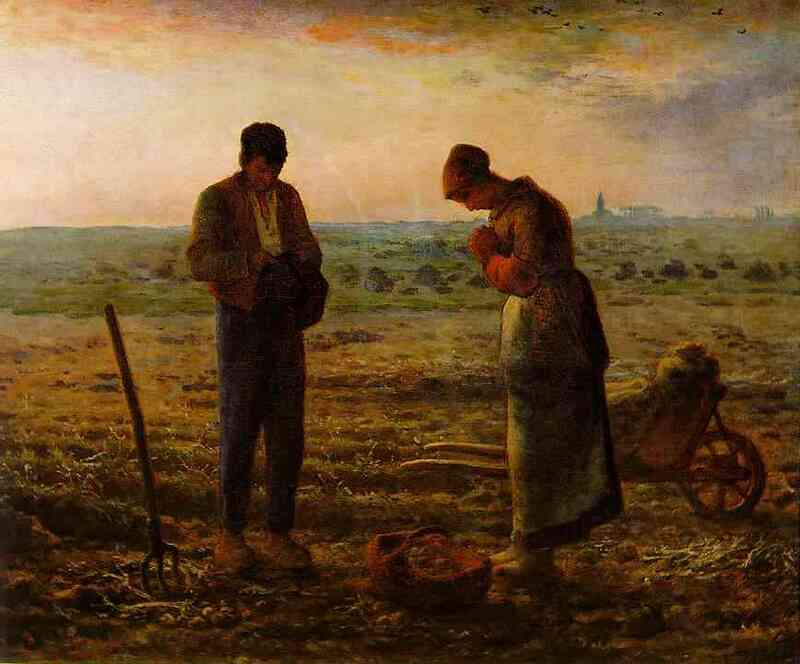 In this 19th century work by the French painter Jean-Francois Millet, a farming couple prays the Angelus at dusk. This wonderful prayer evolved from a recitation of three Hail Mary’s following an evening bell around the 12th century to its present form (with morning and midday recitations) in the 16th century. When prayed in a group setting a leader recites the verses and everyone recites both the responses and the Hail Mary’s in between each verse, as shown above. 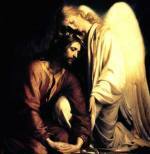 Although the Angelus has been traditionally said three times daily, at 6 am, noon and 6 pm, you can pray it at anytime! It is still accompanied by the ringing of a bell (the Angelus bell) in some places such as Vatican City and parts of Germany and Ireland. The Regina Coeli prayer (which may also be sung as a hymn) replaces the Angelus during the Easter season. 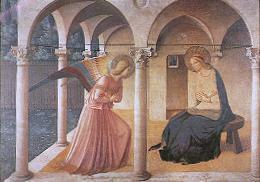 The Angelus reminds us of the Annunciation (shown in this famous rendition at left by Fra Angelico), when the angel Gabriel appeared to Mary with great, (if somewhat startling), news! As we read in Chapter One of Luke’s Gospel, (Luke 1:26-38) God wished Mary, truly a model of humility, to be the mother of His Son, our Lord Jesus Christ! His desire for her brings to mind the line from Matthew’s gospel: “Whoever humbles himself shall be exalted” (Matt 23:12). When Mary calls herself the handmaid, the servant, of the Lord, in the Angelus (from Luke 1:38) it is with inspiring humility and sincerity. How many politicians do we see today who talk a good game about service but basically just want to set up their own little fiefdoms and raid the public cookie jar? Or how many other insincere displays of humility do we see on TV or in our daily lives? She thought of herself first and foremost as God’s servant, seeking glory not for herself but rather for Him. In so doing, she became, as St. Augustine put it rather poetically, a “heavenly ladder, by which God came into the world,” descending from heaven to earth, to become flesh in her womb. Mary was happy to have God work through her. As she expressed it most famously in the canticle the Magnificat, "My soul magnifies the Lord and my Spirit rejoices in God my Savior" (Luke 1:46-47). St. Paul echoed this wonderful sentiment when he wrote that “he who boasts, let him boast in the Lord” (2 Cor 10:17). The Angelus pays tribute to a crucial aspect of Mary’s role in the Incarnation, when it quotes from Luke’s Gospel “be it done to me according to thy word” (Lk 1:38). This wonderful event could not have happened without her consent, without what is known as her fiat. By saying “yes” to God in allowing herself to become His mother, she showed us the ultimate example of trust in our Creator! Do you think that having that kind of faith is too daunting a task? Think about the ways in which God calls each of in our daily lives. Do we say “yes” when Christ wants to work through us in showing His love to others? Or when He asks us to be graceful in trying situations? Prayer and meditation on God’s Word in scripture can help us to do His will. Speaking of God’s word, the Angelus completes its short summary of the Incarnation with the moving reference to our Lord from John’s Gospel: “And the Word was made flesh, and dwelt among us” (John 1:14). 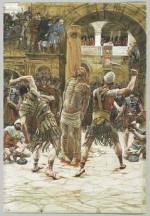 As we read in the letter to the Hebrews, Christ was like us in all things but without sin (Heb 4:15). 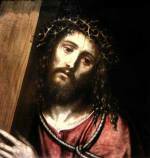 St. Bernard noted that our Lord came to show us His love so that He might then experience ours. The lines that follow about being made worthy of the promises of Christ are also found in the Rosary and tie in well with what follows: an appeal for God’s grace to help us in our pilgrimage of faith. Jesus loved us enough to die for us so that we might live with Him eternally! When we pray the Angelus with humility and love, we are emulating Mary’s faith in His goodness. We are blessed in that we can ask both God and His Blessed Mother for their assistance on our journey towards Eternal Life!